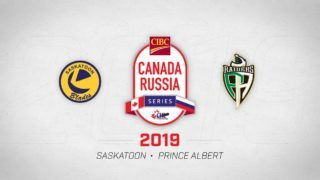 Swift Current, SK – The Saskatoon Blades faced a tall task Friday night, heading into to Swift Current to take on the #2 ranked team in the CHL. 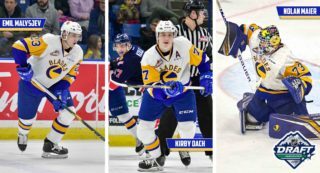 But an offensive outburst from Cam Hebig, a jaw-dropping performance from goaltender Ryan Kubic, and a solid 60 minute effort from the entire roster saw the Blades battle past the Broncos for a 4-3 victory. A main focus heading into the game was to score first and it didn’t go according to plan. 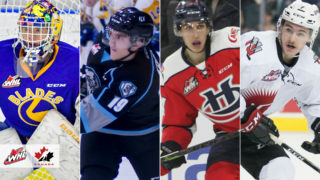 The WHL’s league leader in assists, Aleksi Heponiemi, took advantage of a bobbled puck at the Broncos blue line and went in on the Blades goal alone to make it 1-0 for Swift Current. The single tally would hold up through the first 20 minutes with Saskatoon leading 12-9 on the shot clock. In the middle frame it was all Cam Hebig. The veteran centre struck three times for his first career hat-trick bringing his season goal total to 10. Brad Goethals helped with 2 assists while Mark Rubinchik and Gage Ramsay also chipped in with apples. Two of Hebig’s goals came at even strength while the other was scored on the man advantage. Saskatoon would take the 3-1 lead into the 2nd intermission, again leading on the shot clock 25-24. Swift Current came out hard and fast in the 3rd period and Blades net minder Ryan Kubic was ready for the onslaught. Then, nearly six minutes into period, Blades rookie forward Tyler Lees entered the Broncos zone down the right wing. Lees then dished off to Dryden Michaud in the slot before collecting Michaud’s rebound to make it 4-1 for Saskatoon. The goal was Lees’ 1st of the season in his first game of the year after suffering a broken clavicle in training camp. However, the three goal spread was short-lived. Bronco captain Glenn Gawdin answered for his club just 12 seconds later to cut the lead in half. They weren’t done there either; Artyom Minulin made it a one goal game on the power play midway through the period giving the Broncos a huge dose of momentum. With under 5 minutes to go, Kole Gable found himself in all alone on Ryan Kubic before being slashed by Seth Bafaro resulting in a penalty shot. Despite a fancy Forsberg deke, Ryan Kubic kept the Blades lead in tact. But it wasn’t over there. Almost exactly three minutes later another penalty shot would be awarded to the Broncos, this time to the ever elusive Aleksi Heponiemi. Again, Kubic shut the door to keep the Blades in front by one. The Broncos continued to unload in the dying minutes with their net empty, but Kubic made save after save to preserve the win and earn himself a well deserved 1st star of the game. Heponiemi was named the game’s second star because apparently a hat-trick, +2 rating, and 7 shots on goal from Cam Hebig was only worthy of 3rd star honours in Swift Current. Saskatoon’s power play went 1/4 on the night while the PK was 50% at 1/2. The Broncos also had the edge in the face-off circle winning 59% of the draws and outshooting the Blades 36-33. 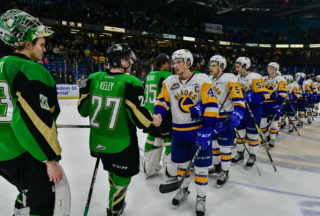 Saskatoon returns home with a much needed win to improve their record to 4-7-1-0 on the season. 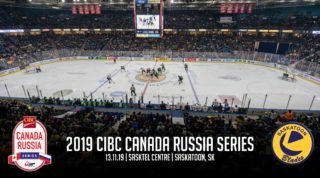 A boost of confidence will be just what the doctor ordered for the Bridge City Bunch as they get set to host the season series opener with the Brandon Wheat Kings Saturday night at SaskTel Centre. The Saskatoon Blades next home game is 7:00pm on Saturday, October 28th for Stick It To Cancer Night vs the Brandon Wheat Kings. Click here for tickets or call 306.975.8844 to book your group night or experience package!